Vitamins are essential for health care and nutrition. Vitamins are micronutrients in the form of organic compounds required by living beings for their healthy functions. The essential bulk nutrients like proteins, fats and carbohydrates are different from vitamins. Vitamins may have similarity in their biological activity but are individually required by the living organism. Vitamins are classified according to their biological activity and may be grouped together for their similar activity, though they may be having chemically different structures. Vitamins have clear-cut and specific roles in the human health care right from the stage of foetus. Vitamins have different functions as hormones, antioxidants, enzymes and catalysts. Vitamins are grouped into water soluble and fat soluble vitamins. Vitamins A, D, E, and K are fat soluble proteins whereas B vitamins and vitamin C are water soluble. Fat soluble vitamins are stored in the body whereas the water soluble vitamins are to be consumed regularly as they are excreted. Severe deficiency of these vitamins may result in diseases like scurvy, pellagra, beriberi and rickets. Two types of deficiencies are encountered. In the primary deficiency a person is short of requirements in his daily intake. Secondary deficiency occurs when an individual is unable to utilize or absorb the vitamins. The first type of deficiency may be tackled by taking balanced food which includes various sources of nutrients. In the secondary deficiency the core problems are to be corrected and the neglect may result in irreparable damages. For water soluble vitamins toxicity does not occur as the excess vitamin is excreted in the urine. As for the fat soluble vitamins as the vitamin is stored in the body, excess consumption in the form of supplements can cause toxicity resulting in diarrhoea and vomiting. Relief can be achieved from the problems by withdrawing the supplements. 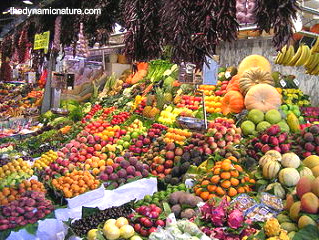 Normally there is no excess in consumption through food sources. A balanced food containing both plant and animal sources gives almost all the vitamins.